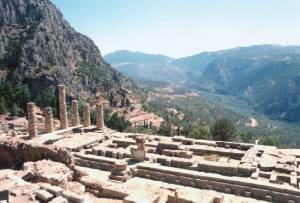 Welcome to Delphi, Navel of the Earth, welcome to the Oracle, to one of the most important archaeological sites in the world, to a place where everyone learns the true meaning of the word "awe." You can discover this ancient and modern fascinating land, choosing from among our proposed itineraries, either using your own car, a rented vehicle, or the local buses. Of course, the best way to explore it all is to join one of our Guided Tours that are offered to the relevant section. With its excellent location and very dramatic views of the Corinthian Gulf and the mountains, the Arion offers 23 spacious and well-equipped guestrooms and suites year-round. This traditional hotel is ideally situated to access the archaeological site of Delphi, and has an extraordinary view of the mountains, and down the valley to the sea and the village of Galaxidi.